These are not for the formal condition. These here are for the few times that call for a suit and a bit of humour. 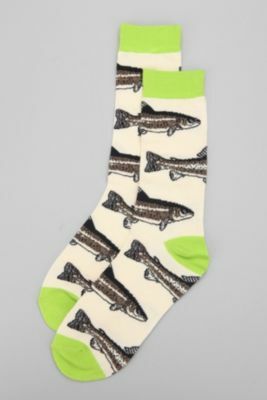 Be the hit of the wedding in these fish printed Country Animal Socks form Urban Outfitters. Just when they thought they had you pegged, up goes the pant leg to reveal these hilariously stylish numbers. Often overlooked, socks are a great way to inject some personality into an otherwise heavy outfit. Available online. This entry was posted in Footwear and tagged Country Animal Socks, Urban Outfitters. Bookmark the permalink.